The essence of a novella is that it has a concentrated unity of purpose and design. That is, character, incident, theme, and language are all focussed on contributing to a single issue which will be of a serious nature and universal significance. What I am working on fits this description pretty snugly. Of course, this should not have been that much of a revelation since I’ve recently been rather fixated by – well – novellas, d’oh! The reason I was dismayed is because it seems that mainstream publishers don’t much like publishing novellas. Once upon a time they did (The Time Machine, Death in Venice, Heart of Darkness) but in these more commercially-fixated times, they don’t. This seems to be because there are minimal costs associated with publishing any book and so a novella probably has to be charged at the same rate. Someone picking up two books that are almost the same price, but one is sliver-thin, and the other thick enough to prop a door open (a joke made to me often about my own books – and a not unreasonable point – after all, a student riot should be able to see off even the best armed police with a few volleys of my books *grin*). An aspect of ‘physicality’ is that it finds a different, perhaps more instinctive, way into our brains. For example, when I see a time such as 2:36pm on a digital display I always think – oh, that’s only 20 minutes away – so it is really 3pm and there’s no point in starting anything new (this mostly happens when I’m working…). However, if I see the same time displayed on a clock face, it suddenly looks much more like half an hour before 3 and that’s plenty of time to do something. 2:36 is a virtual form of the time, and we can easily play games with virtual things. A clock face is like looking at a sliced up cake – and the size of a wedge of cake is not something I for one ever make mistakes about! Anyway, my core point is that once books move into a virtual form on an ebook – then their thickness will vanish into abstraction. Of course the number of pages will still be displayed for a book – but this is just one number versus another – not something you can ‘feel’. and this on a plethora of devices with different numbers of pixels, where the font size can be modified according to the preferences of the reader – all of which will change the number of pages that any book will span in the device. It seems to me likely that other aspects of the book will come to dominate the mind of the reader. It seems to me that we are on the verge of a renaissance in shortforms. We are all so busy these days and there is so much out there to tempt us and to consume, that naturally people are gravitating to art that can be quickly and intensely enjoyed. Though I’m sure there will always be time for more leisurely pleasures, as with the ‘album’ in music – an artistic form dictated by the capacity of a standard vinyl disk – once freed of physical constraints, an artistic ‘object’ can find its own natural size and form. For me such a day of liberation cannot come soon enough. Other thought on novellas: people’s competitiveness about what books they have read is a factor. So many people bemoan the fact they haven’t read Proust or Tolstoy or Dickens, or other authors whose works are associated (rightly or wrongly – I’m sure each of these must have shorter works) with extreme length. People feel they’ve failed at being intellectuals or literati if they lack the time, energy and/or stamina for massive literary tomes – and that includes the latest lauded writers as well as classic authors. I think it’s kind of a litmus test… Literature snobs would wield Proust or Tolstoy as a measure of intellect – while (to hop to another analogy) you can really love arias and opera music whilst dreading having to sit through the full Ring cycle. Unfortunately, the popular impression IS that if you haven’t ‘mastered’ War & Peace, you’ve somehow failed as an intellectual – as if it’s a test one has to sit through. If you click the button to “turn the page”, it refreshes the screen (changes the virtual page), but the display of the page number doesn’t increase because you’re still in the same page in the document (at 1:1 scale), even if you’ve changed “pages” in the zoomed in version. So when you increase the font size, the total number of pages reported by the device doesn’t increase. In a way, I think that’s an interesting behaviour, since it strengthens the analogy between e-book and paper-book, rather than undermining it. The e-book still has its physical counterpart as a “standard”. hmmm… but surely this still remains a virtual metric. What would happen to this were paper books to disappear? If we imagine the same book being read on an iPhone and an iPad, what would be the point of maintaining an absolute page numbering system? If I was regularly reading books on the iPad, I would be concerned with how many page turns I would have to make – and the same process would surely occur if I mostly used an iPhone as my reading device… I suppose that it might be useful to have an idea of an absolute size of the book – but why would this be in pages? Why not words? If pages, the publisher could effectively choose whatever number of pages they wanted… (by selecting a nominal page size and typography)… If words, then potentially this could actually make the current position worse – undermining my premise – as people became fixated on word counts – and even – god help us! – words per dollar!! Because a book’s word count is unfamiliar and meaningless information to most readers (i.e. non-novelists/non-publishers), so not useful in terms of choosing a book. If you tell me a book has 200,000 words, I can’t mentally extrapolate from that the length of the book, so if it’s an ebook, I can’t relate it to equivalent paper books and gauge anything about the reading experience from that. Whereas if you say it has 400 pages (not saying the two would match – I just don’t know! ), I can picture the amount of reading involved. Word count, and Ang would agree, would indeed be the logical Unit of Measurement… But as you know, sometimes outdated units of measurement stick around, because people are familiar with them. Of course, page count has always be grossly inaccurate, because a 200 page of dense print can have more content than 400 with bit type and wide margins. Even word count doesn’t take into account (aha) whether they are long or short words, whether the text is difficult or not. A man was standing at a crossroad. A passing farmer asked whether he was lost. The man: “I need to go to the village.” Farmer: “It’s that way”. Man: “How long will it take me to get there?” to which the farmer replied he didn’t know. The man shrugged and started walking. The farmer observed the man while he walked away, then called after him: “It’ll take you about half an hour”. Like your parable :O) – is it Dutch? I concur with Rem. Some units stick around for no discernible reason, and some stick around just because they’re from “another time”, or a mark of literacy, erudition, etc. If paper books aren’t going away, they may end up with that status – something like a gold-standard for books. 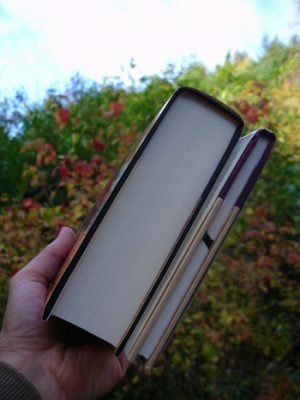 I think that at some points thin books are even better than fat books for more than one reason. For example, when I’m travelling I always look for thin books, they are easier to carry and they fit better in the suitcase or bag. And sometimes it’s nice to read books really quickly and not wait too long for the end of the story ( in some occasions life is on fast speed and it’s too much time consuming). Publishers should know these things… And it’s great for a writer to do different things and get acknowledged for them… So, I’ll be waiting for the publishing of your novella. Good luck! Not just that, but actually many of my favourite books are novellas. It might be because I’m lazy, but in general, I like the amount of space a novella provides. The words don’t completely bury your imagination. The Little Prince – probably my most reread book, and I NEVER get tired of it. They say a short story is the most poetic form of prose, and so by extension, a novella is probably somewhere in between that and an extended novel. For a writer, a great example is Wordsworth. The more brief his poems were, the more effective – the Lucy poems were great, as is Daffodils, but my gosh, Tintern Abbey was a chore. To my mind, a good novella is like a Chinese painting – it’s brief, forceful, and memorable. I think novellas in general have to be somewhat sad – one is always somewhat disappointed when it ends because one wants more; however, novels I’m usually quite happy to finish (even if it has an open ending). And I don’t think books will ever go entirely digital. There’ll always be somewhere with a population too poor for one e-reader per hundred consumers. Lovers of real books will buy from them and keep their economy afloat. Shorter books are pretty popular in the ‘literature’-field… And that seems to be a better market for your kind of writing. Even the novella has made a comeback-nicely presented, heavy paperstock – where the book as object brings added value to the book as text only. See Susan Hill, The Man in the Picture. I guess that we, as readers, are used to such huge books that we tend to turn our eyes from novellas. It seems that we will reach the last page wanting for more… and besides, as you told, the final cost of a short book is very similar of a larger one. I hope that it will be published here in Portugal… we are having such a boom of fantasy books – some of them quite bad – and its awesome to read from good writers. http://www.businessweek.com/ap/financialnews/D9IQ9VFO0.htm or something – although I did not read it there. I think in fact that Amazon are pushing something like this – “shorter ebooks” – either self published or not. I’ll see if I can track down a link.